Kyle, Heather & Jeff get stranded on Sollgel Island with some scientists, gigantic insects, Godzilla and the derpiest little monster to ever hit the silver screen… Minya. Happy Halloween, everyone! 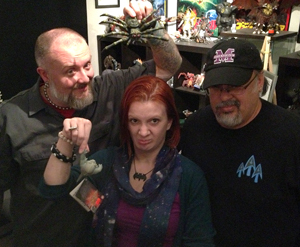 My gift to you is the newest episode – which was recorded with Heather, Jeff and myself the other night in which we watched and then discussed the 1967 Toho classic, Son of Godzilla. This is a fun flick that I think at one point during the episode I ranked at the top of the list of bad Godzilla films. Regardless, we had a great time watching the film. Thanks to everyone who sent in their homework. Hopefully next month’s movie will get as many great submissions from the listeners! Please make sure to click on some of these stories down below in the suggested reading section – there are some really great updates to some already awesome news for kaiju fans out there! And as usual, we have boatloads of awesome events happening in town. If you are anywhere near the Portland area, I highly suggest checking out GeekPortland.com and making it out to some of these shindigs! Also, the last performances of Turkish Star Wars and Lost Boys Live are the 1st, 2nd & 3rd! For these and many more events, check out GeekPortland.com to schedule your geekery! So, I tried giving Media Blasters a couple of months to release Gamera the Brave on Blu Ray and they just keep pushing the blasted release date back. 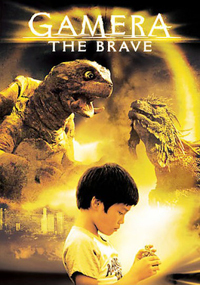 I feel like I can’t wait anymore and we are officially making the movie of November the 2006 Gamera The Brave (also known as Gamera Little Braves). Hopefully we will have a special guest in the HQ for that recording! For those that want to see what we see, we will be watching theMedia Blasters DVD that was released back in 2008. If you’d like to send in your homework (aka your thoughts, questions and reviews) to be included in the next discussion episode, just make sure you do so before November 18th. Send me an email with the subject of “Daikaiju Discussion” and we’ll make sure to include it in the next discussion.